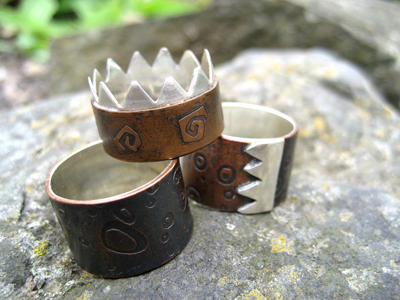 These rings are made from silver and copper. They are called Journey Rings because they will change over time as the journey is made through life. The copper starts off a dark brown colour, gradually getting shinier as they are worn. My sister and my boyfriend have been wearing one each for a few months now and say that some days they are shiny, some days they are a matt copper colour and some days they are quite brown. The rings are designed for both men and women and are practical and comfortable enough to be worn everyday. It is an old folk remedy that copper jewellery can provide pain relief for arthritis and rheumatic problems due to the copper being absorbed by the skin. Although sometimes the copper in them will turn your finger green underneath, this can be easily removed with soap and water. If upon purchasing one of these rings you wish it to be returned to its original colour then please e-mail me for details. To make it shiny you can use any metal polish as directed.